Tea flavored treats have long been popular in Japan, and this spring, Krispy Kreme Doughnuts Japan will be coming out with several tea-themed items of their own, each with some creative East-meets-West twists. 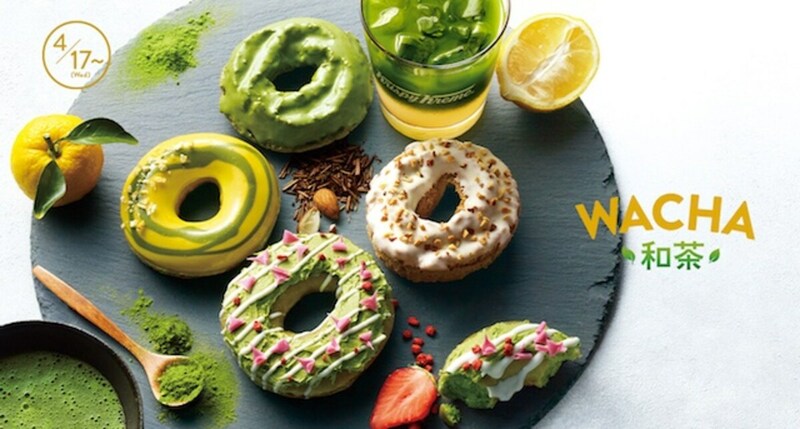 That’s right, Krispy Kreme Japan’s new “Wacha” (which literally means “Japanese tea”) menu offers doughnuts that combine Japanese matcha and roasted hojicha green tea with ingredients like fruits and nuts, and some refreshing tea-infused cold drinks as well. The aim is to provide consumers in Japan with a fresh take on tea flavored sweets by combining Japanese tea with unorthodox ingredients. Both the doughnut and the green cream on top here contain Uji matcha, powdered green tea from Uji City in Kyoto. The matcha cream is further topped with lines of white chocolate, strawberry-flavored pink curled chocolate shavings and freeze-dried strawberries. The matcha and strawberry should provide a nice contrast both in flavor and color. This brightly colored doughnut is also made with a Uji matcha base, topped with a white chocolate layer coated with a mixed lemon and yuzu citrus glaze, plus swirls of matcha chocolate and pieces of yuzu peel for the finishing touch. The flavor of the matcha tea and the zesty citrus should make for a refreshing combination. This is basically a hojicha (roasted tea) latte turned into an old-fashioned doughnut. The doughnut base is infused with the roasted aroma of hojicha, and the white chocolate coating and roasted almond bits on top only add to the flavor and texture. This green treat is simple and Matcha-packed, as it involves a base doughnut again containing matcha from Uji City, topped with quality matcha chocolate. This unique lemonade mixes Uji matcha with yuzu sauce containing actual pieces of the fruit and added lemon syrup. The subtly-bitter green tea and tangy lemon should make for a refreshing combination, while the green and yellow gradation makes it delightful visually as well. Here, they’ve turned a latte with roasted hojicha tea into a sweet frozen drink containing genmai (brown rice) puffs and topped with whipped cream and hojicha-flavored sauce. The toasty flavor of the hojicha and the texture of the rice puffs should make this a delight to drink. If you’re interested in trying the wacha menu, most of the items will be offered for a limited time. All the doughnuts will be available from April 17 to late May, 2019, except for the Uji Matcha Old Fashioned Doughnut, which is currently part of the regular menu. The two cold drinks will go on sale also from April 17, 2019, with the Uji Matcha Lemonade scheduled to be available until early June and the Krispy Frozen Hojicha and Genmai Latte until mid-June. Sure, we know the folks at Krispy Kreme are spoiling us with their seasonal offerings and simply too-cute-to-eat treats, but we’re certainly not complaining!